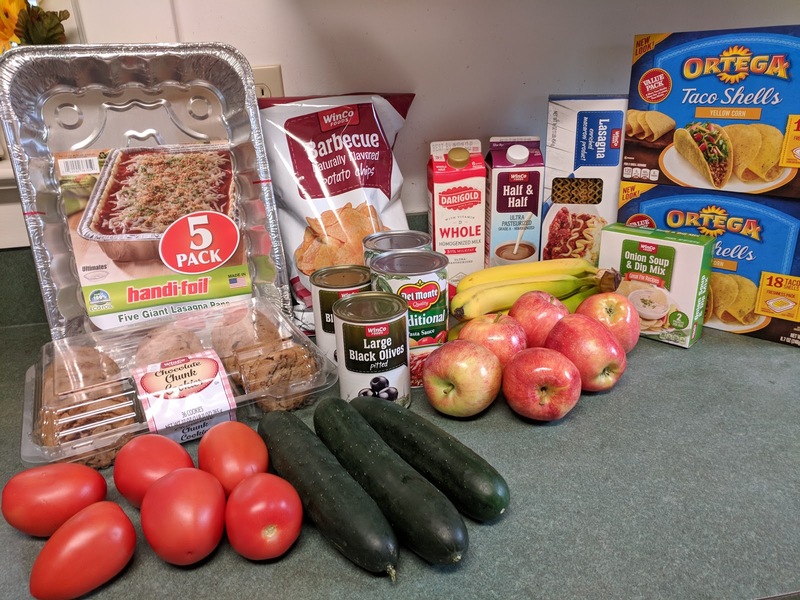 This week was another spendy week for groceries. With my upcoming family gathering I'm getting extra food in the house. It's not every year we can get most of the family here at the same time so we're celebrating. :) Aside from our children and their families we'll have a few extra people here who wanted to take the opportunity to stop and see everyone. My meal planning is based on that. I got the regular fruits and veggies. I didn't need any greens for salads because I had spinach, romaine and cabbage still in the fridge. I purchased the typical items such as milk, half n half, chips and cookies. I bought olives for the pantry because they were on sale and 2 cans of spaghetti sauce and lasagna noodles. I bought 2 large boxes of taco shells as we'll be having a taco night while my out of town kids are here. And a box of onion soup mix for making dip. I do include the lasagna pans in my grocery budget as they are food related. 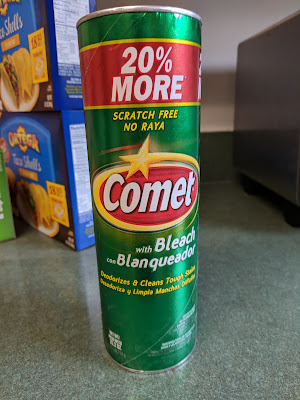 I purchased a can of Comet. I buy very few cleaning products as I mostly use vinegar for cleaning but I have a few things I use Comet for.. I don't include cleaning products in my grocery budget as that goes under household supplies. Next stop was Costco and this was the expensive stop. 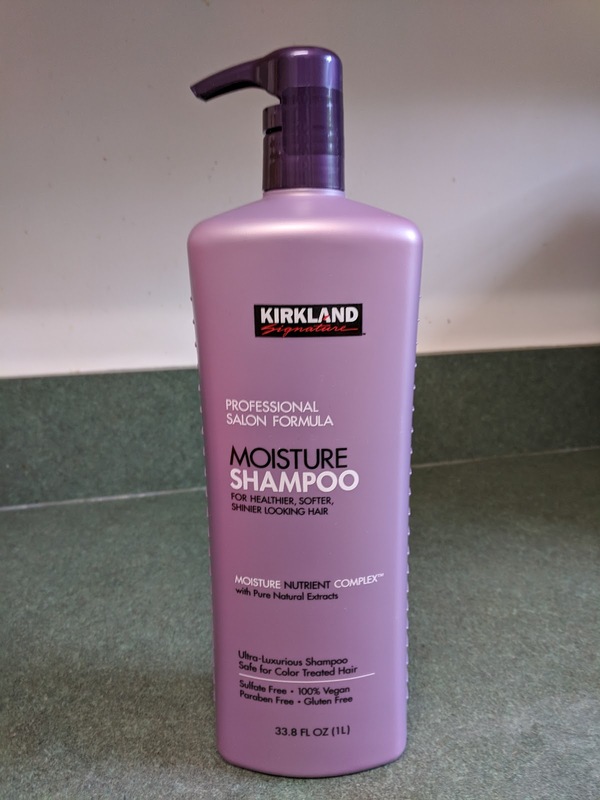 It sometimes seems to me that the Costco haul can look small but cost a lot (especially this one)! I was out of olive oil so I picked up a 2 pack. It's a lot of oil and with only the 2 of us I might have to worry about it going rancid except for the fact that I also use it for making soap. It's the best deal I can find on olive oil, even lower quality oil (that could be used for soap making) is more expensive than this. I get a total of 6 liters of oil for $33.99, making it approximately $5.70 a liter. I also purchased a box of granola bars, 4lbs of butter and two large containers of cottage cheese and 5lbs of mozzarella. Those last 2 items will be used to make the lasagna. The Kings Hawaiian dinner rolls are my favorite. I don't buy them often but when I do it's always from Costco as it is the best price on them I can find here. 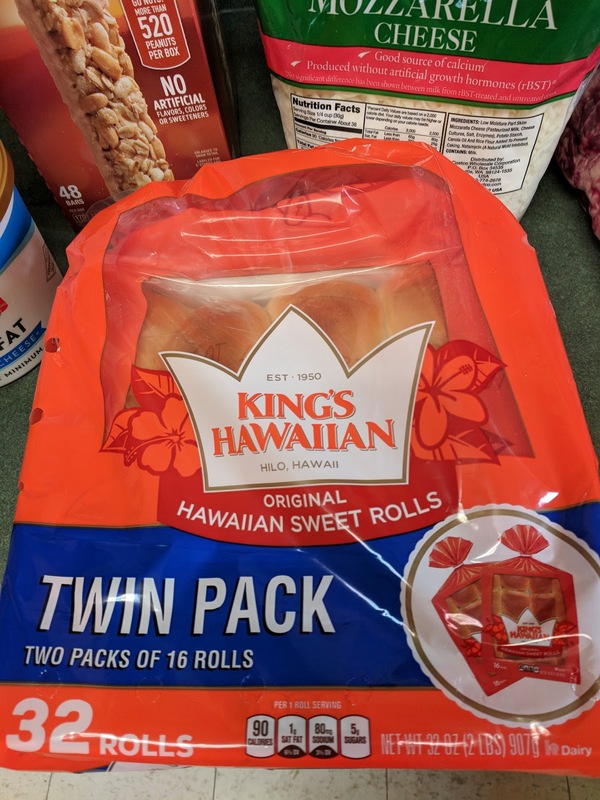 I got 2 – 16 roll packages (32 rolls total) for $4.99. 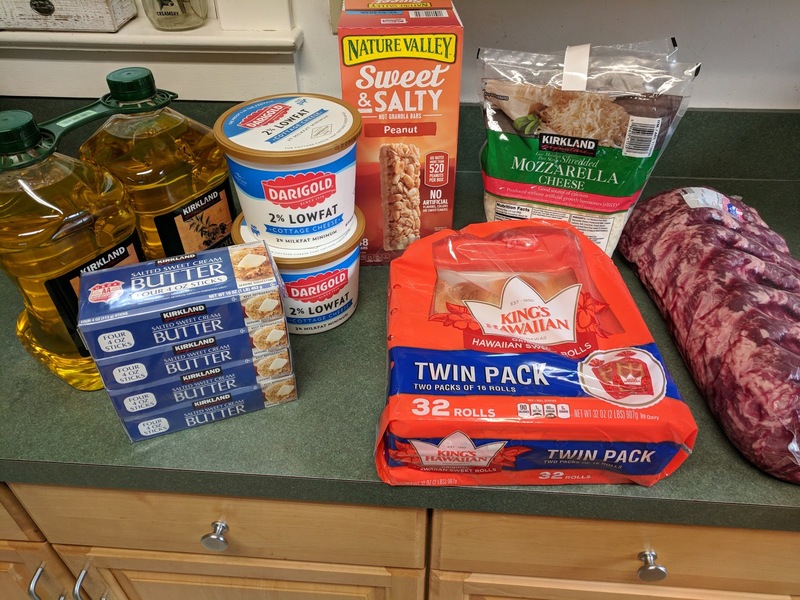 I used one package of them for making sliders when my grandchildren were here, as I'll show you at the end of this post. 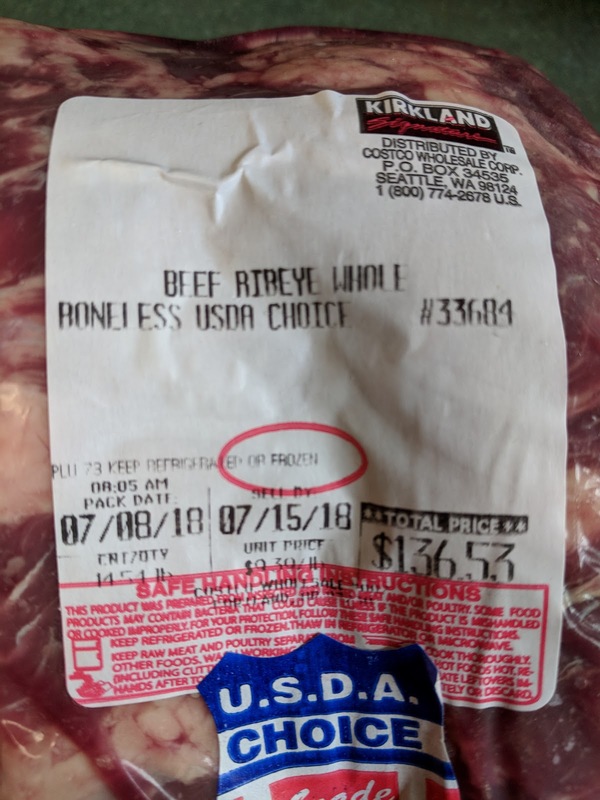 The BIG expense was another package of steak. 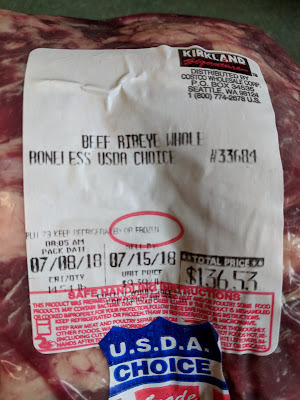 This one was rib eye and again I cut it up myself (as I showed you in a previous post) because it was the best price. 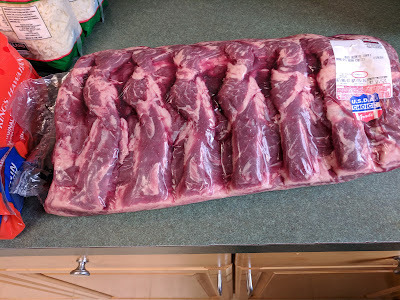 I'm not saying it was inexpensive, just the best price I have been able to find, which was $9.49 a pound. It's the first time I've seen it around here for under $12 a pound. This of course will be part of what we serve for the family BBQ. And I'm sure we'll have steak left in the freezer after our big day. It will be the last of my steak purchases for quite some time now, I'm confident we have enough to enjoy a few BBQ's later on in the summer. 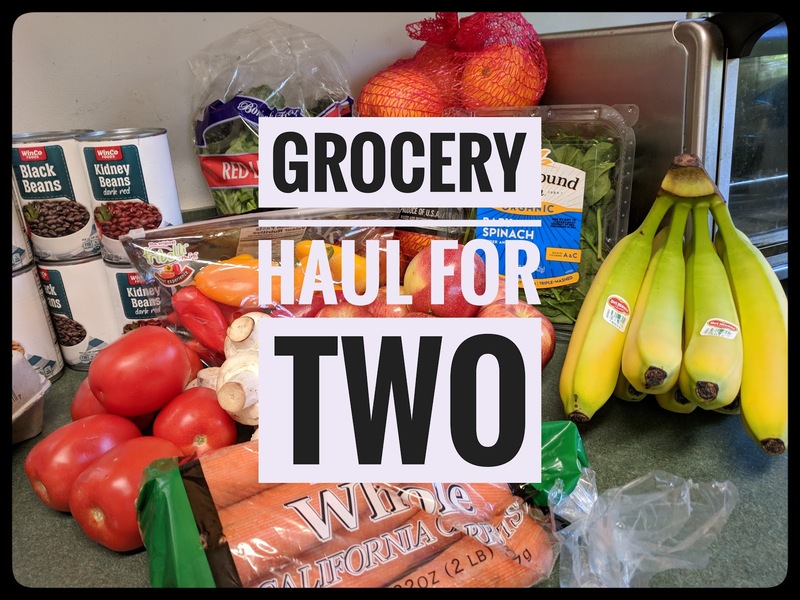 I don't include this with my grocery totals as it is budgeted under personal items. These are so easy and quick to make. 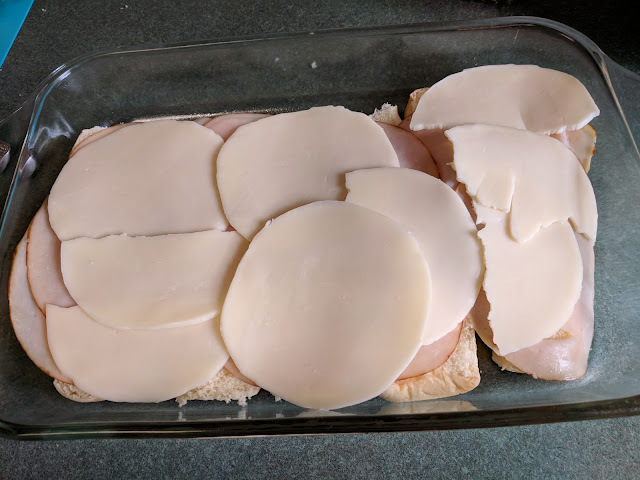 I used turkey lunch meat, but you can use whatever lunch meat you would like or is your favorite. I also used provolone cheese because it's what I had on hand. Again use your favorite type of cheese. The options are endless. I was making these primarily for my grandchildren, so I didn't add anything else to them. But, you could add sliced onions or peppers or your favorite sandwich toppings. Slice the dinner rolls in half and lay the bottom half in a baking dish. 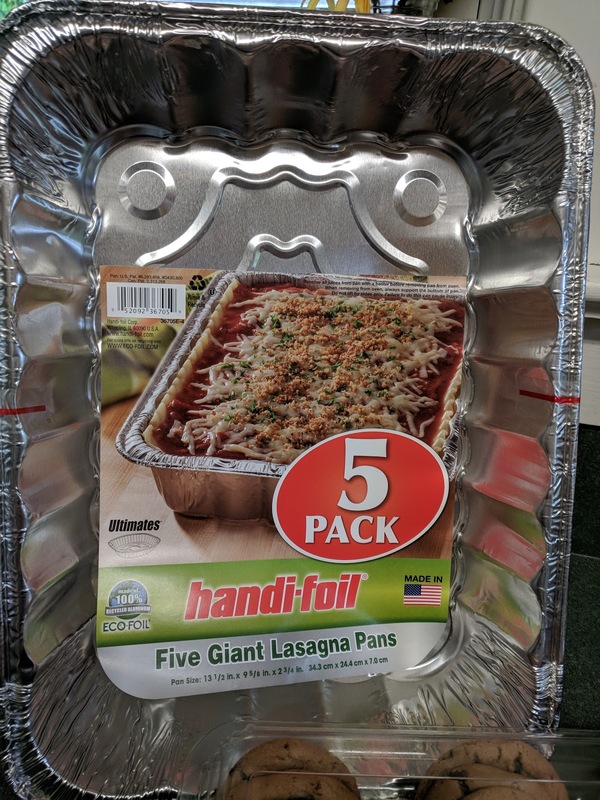 I had 16 rolls and it fit well into a 9x13 pan. I sprayed the bottom of the pan first with a little coconut oil spray to prevent sticking. Drizzle with your favorite sauce (I used ranch dressing).. 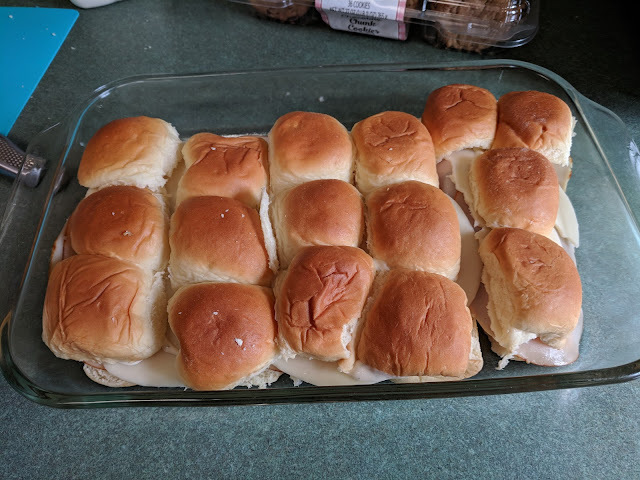 Put the tops of dinner rolls on top.. Melt a couple tablespoons of butter and brush over the tops of the dinner rolls. 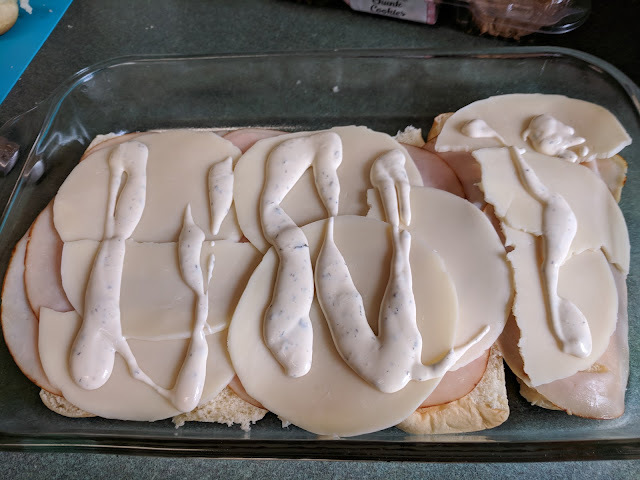 Bake at 350 for 30 minutes or so, until the tops are brown and the cheese has melted. I apologize for not having a finished product as my grandsons were here and quickly ate them all up :)..
That's all for this week's Grocery Haul!